Girls und Panzer has been adapted into an anime, which aired last fall in Japan and is currently streaming on Crunchyroll. Sentai Filmworks licensed the anime and will release it on home video in 2014. The anime has also spawned a theatrical animated film, which is set to debut in 2014.Each volume of the Girls und Panzer manga series contains color inserts and also features the illustrated specifications for the various tanks that appear in each book. In Fall 2014, Seven Seas will publish the Girls und Panzer prequel series: Girls und Panzer: Little Army .Miho Nishizumi, a new transfer student to Ooarai All-Girls High School, would like nothing more than to enjoy a peaceful, stress-free school life. Unfortunately, her new school just revived its tankery program and enlists Miho to put together a team so that they may compete in a national tournament.As Miho struggles to overcome her turbulent past with tanks, she must first learn to tread lightly with her eccentric companions. Can Miho possibly plow through the challenges and master the art of tankery, or will she get left behind in the dust? Miho Nishizumi, a new transfer student to Ooarai All-Girls High School, would like nothing more than to enjoy a peaceful, stress-free school life. Unfortunately, her new school just revived its tankery program and enlists Miho to put together a team so that they may compete in a national tournament.As Miho struggles to overcome her turbulent past with tanks, she must first learn to tread lightly with her eccentric companions. Can Miho possibly plow through the challenges and master the art of tankery, or will she get left behind in the dust? Tank girls take the front seat in this new manga series based on the popular military anime. Girls und Panzer has been adapted into an anime, which aired last fall in Japan and is currently streaming on Crunchyroll. Sentai Filmworks licensed the anime and will release it on home video in 2014. 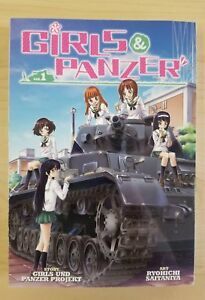 The anime has also spawned a theatrical animated film, which is set to debut in 2014.Each volume of the Girls und Panzer manga series contains color inserts and also features the illustrated specifications for the various tanks that appear in each book. In Fall 2014, Seven Seas will publish the Girls und Panzer prequel series: Girls und Panzer: Little Army .Miho Nishizumi, a new transfer student to Ooarai All-Girls High School, would like nothing more than to enjoy a peaceful, stress-free school life. Unfortunately, her new school just revived its tankery program and enlists Miho to put together a team so that they may compete in a national tournament.As Miho struggles to overcome her turbulent past with tanks, she must first learn to tread lightly with her eccentric companions. Can Miho possibly plow through the challenges and master the art of tankery, or will she get left behind in the dust?